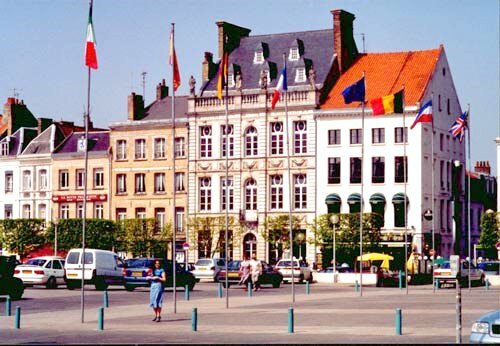 Saint-Omer and its region are located about 30 minutes from the Euro Tunnel exit. It is simply the part of France closest to England. With its bourgeois 17th century buildings, Flemish style architecture and many vestiges of the Middle Ages, Saint-Omer is a charming city whose streets conceal many noble dwellings and private mansion houses. This Town of Art and History, boasting an imposing gothic cathedral, has numerous facets to be discovered. 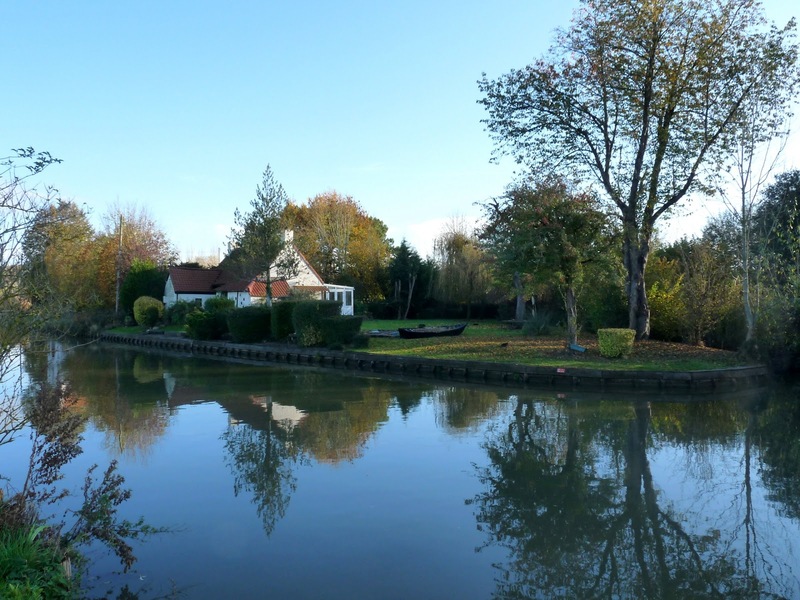 Further to the South, Aire-sur-la-Lys is another jewel of a town, again with many fine buildings and 18th century town houses, watermills, old breweries and malting houses along the banks of the river Lys. 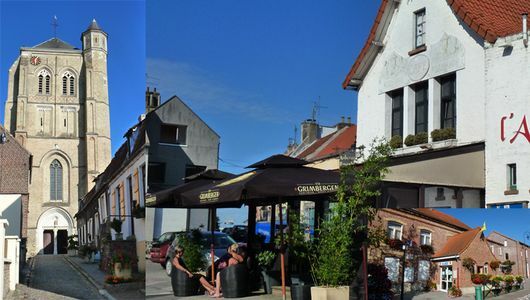 Thérouanne and La Morinie reflect the prestigious past of this region, from where Saint-Omer was founded in the 12th century. The history of past centuries and the more recent industrial age have left their marks. 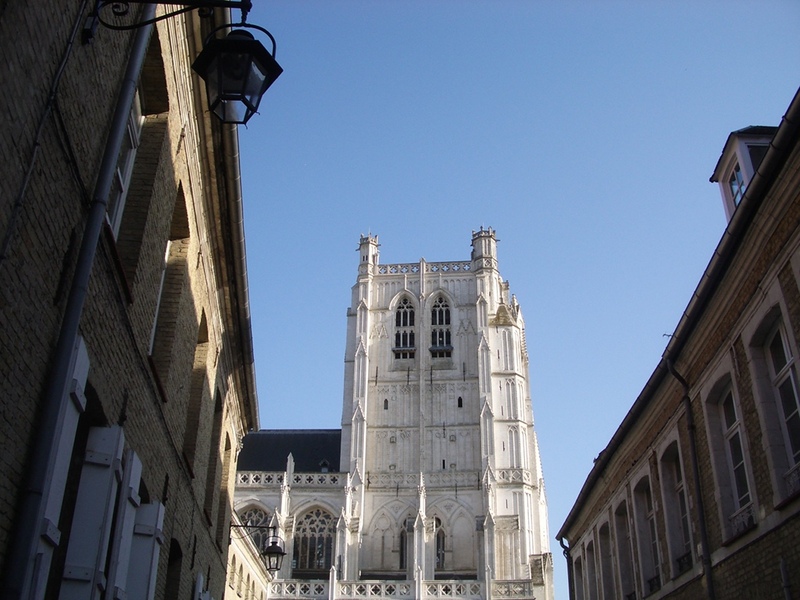 From the ruins of Saint Bertin's abbey to the Benedictine abbey of Wisques, the Saint-Omer region shows the successive influence of different religious orders. In 650 King Dagobert decided to christianize the nothern part of his kingdom. He entrusted this mission to four monks: Omer (Audomar in latin), Bertin, Momelin and Ebertram. 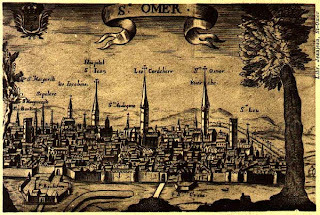 Omer became bishop of Thérouanne, while his three companions settled in the dense forests and marshlands. A great deal of perseverance was needed by the Benedictine monks to gradually transform a common bog into the only cultivated marshlands in France. Thirteen centuries spent rerouting the waters of the river Aa to flow into the sea, and raising, draining and clearing the land before it could be cultivated. 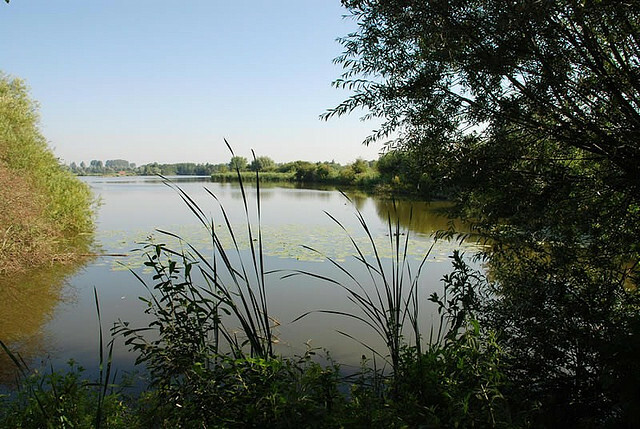 Where water and land come together as one, the Audomarois marshes are an idyllic place to discover, whether on foot or by boat. Reclaimed over the centuries, the water that spill out into a myraid of ramifications from the river Aa meander gently on their way. Just a few kilometers from the Opale coast, the change of scenery is extraordinary. Whether on foot, or horseback, by bike or boat, the marshes are accessible to everybody. There are all sorts of leisure activities, trails, guided tours, guided marshes cruises and walks to be enjoyed, with or without a guide. It is however a fragile environment that must be respected. 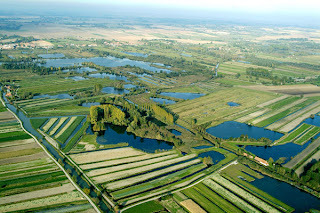 The Audomarois marshes are today the only remaining cultivated wetlands in France, with around forty market gardeners working 440 hectares of land. Although its produces fifty different vegetables, it is particulary well known for its delicious cauliflowers (5 million heads grown per year) and succulent endives. It has an abundance of plant and wildlife within a marvellous ecosystem : 300 species of plants, including one third of France's aquatic plants, 210 species of birds observed in the last 20 years. A few secundary residences share the rare priviledge of being in this exclusive environment. The Reserve Naturelle Nationale du Romelaere at Clairmarais ...a mosaic of lakes and rivers providing a perfect setting for a pleasant walk. When the sea retracted in the 4th century B.C., it left a huge area of wetlands known as “le Romelaëre”, formerly considered to be an impraticable marshland. It was named after Guillaume Romelaëre who exploited the peat deposits from the 18th century to the end of the 19th century. 2008: Romelaëre classified among the 160 conservation areas (Réserve Naturelle Nationale) in France . The Romelaëre Nature Reserve is now a paradise for botanists and birdwatchers, as well as hunting and fishing enthusiasts. It counts 250 species of plants, 200 species of bird, 70 of which are nesting birds, 17 species of fish, 19 types of dragonflies and 11 of bats. Walks starting at the Maison du Romelaëre (Clairmarais) : A number of trails have been devised to be accessible to all visitors, whether they have hearing or sight disabilities or reduced mobility; the trails include listening points and a bird-observatory. Special signs and aids (plaques in Braille, life-lines, studded paths) have been installed all along the trail as well as bench seats. 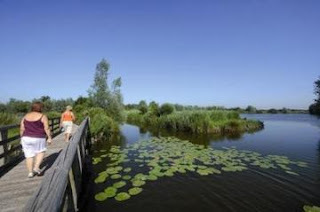 Countryside and Paths : In the heart of the Parc Naturel Régional des Caps et Marais d'Opale, the Saint-Omer region offers 1500 km of walks, horse-riding, cycling and mountain bike trails. Stop off at one of the friendly Estaminet Randonnée on the way to recharge your batteries. Located in the Nord department, Watten is a commune which is surrounded by the rivers Aa and Colme, the former being part of the canal routes linking Calais, Dunkerque and Belgium. In the centre is the Church of Saint Gilles, built in 1236, which stands out as the key monument of the commune. 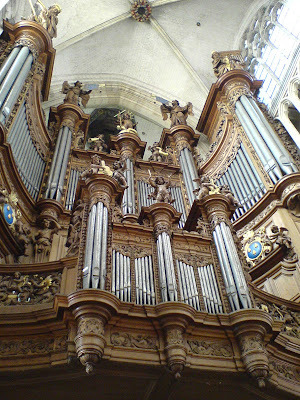 The architecture of this church draws scores of visitors every year. 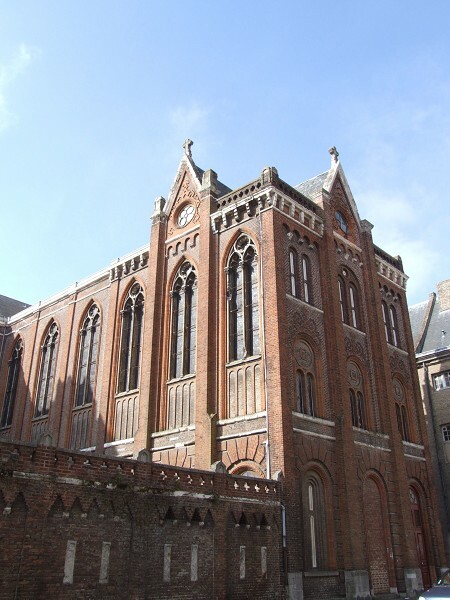 Furthermore, the hill next to the commune, dubbed “The Guardian Angel”, has an abbey which was erected upon it in the 17th century by Jesuits from Great Britain. Also, the windmill at the hill’s summit and its partly remaining citadel dates back to 1731 and has in recent years been largely restored. There are numerous shops and small businesses including cafes, restaurants and more functional ones such as banks, a post office and pharmacies. 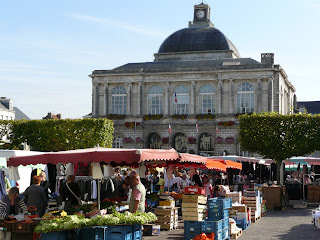 The commune has a market which takes place every Friday and activities such as archery and cycling are popular in the area. There are also many walks and paths through stunning forests and scenery including the “Bois Royal”, named after King Louis XIV who once walked through it. Entertainments include the festival of Pentecost, celebrated annually at the beginning of June. Transport from Watten comprises a station with trains departing hourly towards Boulogne, Calais, Dunkerque and Lille. It is situated 30 minutes from the Eurostar, ferries and Shuttle station at Calais. Lumbres is a commune in the Pas-de-Calais department, at the intersection of the valleys of the rivers Aa and Bléquin, some 6 miles west of Saint-Omer. 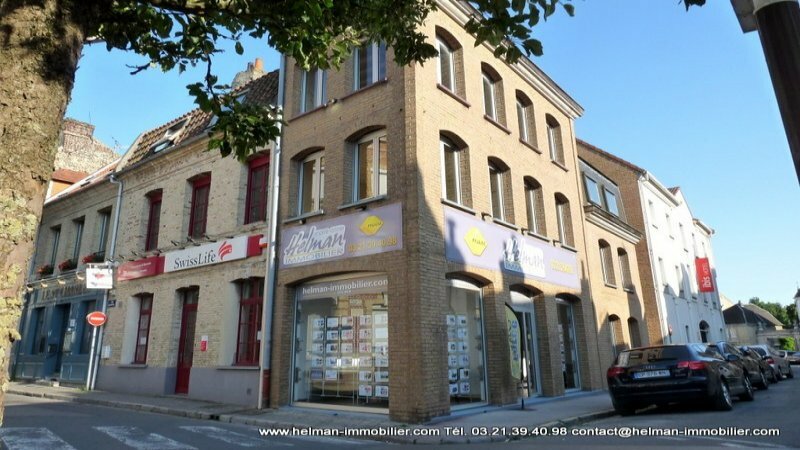 The town has all the amenities and services you would expect including bakeries, pharmacies, markets, doctors, schools... For the sports enthusiasts and the nature lovers there are several activities including golfing at the Saint Omer Golf club, swimming, hiking, fishing and karting. You can also discover the beautiful region through more original ways, with the Rando rail, a 19th century railroad converted into a fun tour for those seeking an adventure, with a rented 2cv, with a quad bike, aboard a boat or a 4x4. Lumbres is just 30 min away from the ferry port of Boulogne sur Mer, 30 min from the Eurostar stop at Calais and only 100 minutes from Beauvais international airport with low costs flights from the UK. 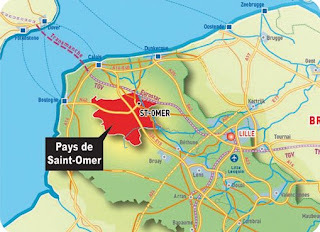 Saint-Omer (Sint-Omaars in Dutch), a commune and sub-prefecture of the Pas-de-Calais department 68 km (42 mi) west-northwest of Lille on the railway to Calais. The town is named after Saint Audomar, who brought Christianity to the area. 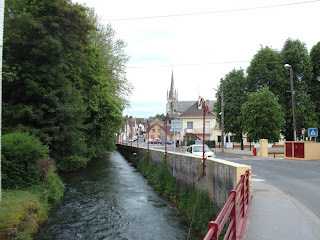 The canalised portion of the river Aa begins at Saint-Omer, reaching the North Sea at Gravelines in northern France. Below its walls, the Aa connects with the Neufossé Canal, which ends at the Lys River. Adjacent to Saint-Omer (or St. Omer) is the community of Haut-Pont (Haute Ponte), the historic Belgian and much earlier, the various French-Netherlands boundary in a number of centuries. 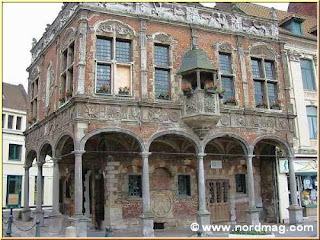 There is a small but evident West Flemish influence in the town. Saint-Omer has also some older speakers of Picard or Ch'ti(mi) who are organizing to preserve the language. Saint-Omer first appeared in the writings during the 7th century under the name of Sithiu (Sithieu or Sitdiu), around the Saint-Bertin abbay founded on the impulsion of Audomar (Audomarus, Odemaars or Omer). 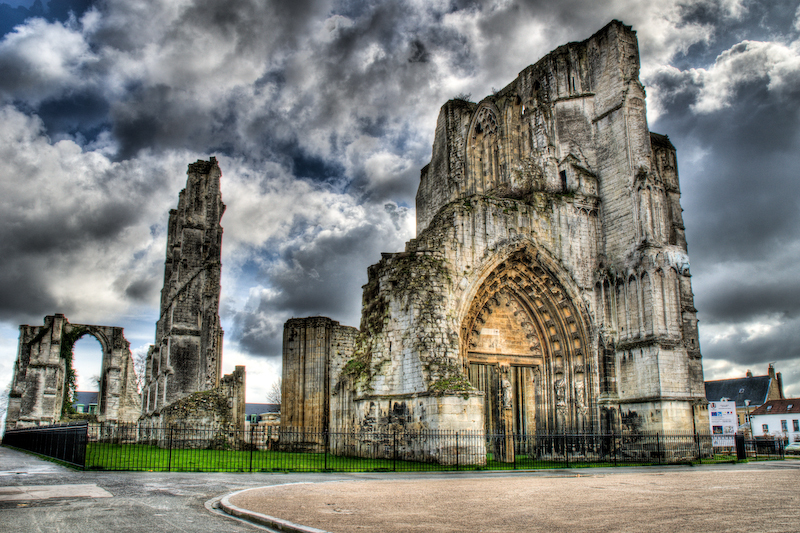 Omer, bishop of Thérouanne, in the 7th century established the Abbey of Saint Bertin, from which that of Notre-Dame was an offshoot. 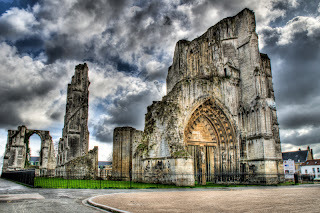 Rivalry and dissension, which lasted till the French Revolution, soon sprang up between the two monasteries, becoming especially virulent when in 1559 St Omer became a bishopric and Notre-Dame was raised to the rank of cathedral. In the 9th century, the village that grew up round the monasteries took the name of St Omer. The Normans laid the place waste about 860 and 880. Ten years later the town and monastery had built fortified walls and were safe from their attack. 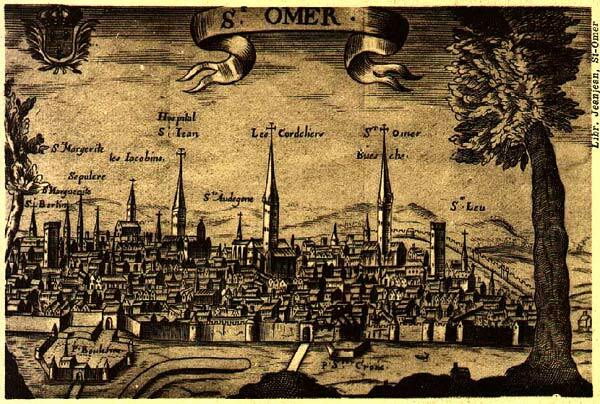 Situated on the borders of territories frequently disputed by French, Flemish, English and Spaniards, St Omer long continued subject to siege and military invasions. In 1071 Philip I and Count Arnulf III of Flanders were defeated at St Omer by Robert the Frisian. In 1127 the town received a communal charter from William Clito, count of Flanders. In 1340 a large battle was fought in the town's suburbs between an Anglo-Flemish army and a French one under Eudes IV, Duke of Burgundy, in which the Flemish force was forced to withdraw. In 1493 the town became part of the Low Countries and under Spanish dominion for more than 170 years. The French made futile attempts against it between 1551 and 1596. During the Thirty Years War, the French attacked in 1638 (under Cardinal Richelieu) and 1647. Finally in 1677, after seventeen days' siege, Louis XIV forced the town to capitulate; and the peace of Nijmegen permanently confirmed the conquest and its annexation by France. In 1711 St Omer, on the verge of surrendering because of famine, was saved by the daring of Jacqueline Robin, who risked her life to bring provisions into the town. 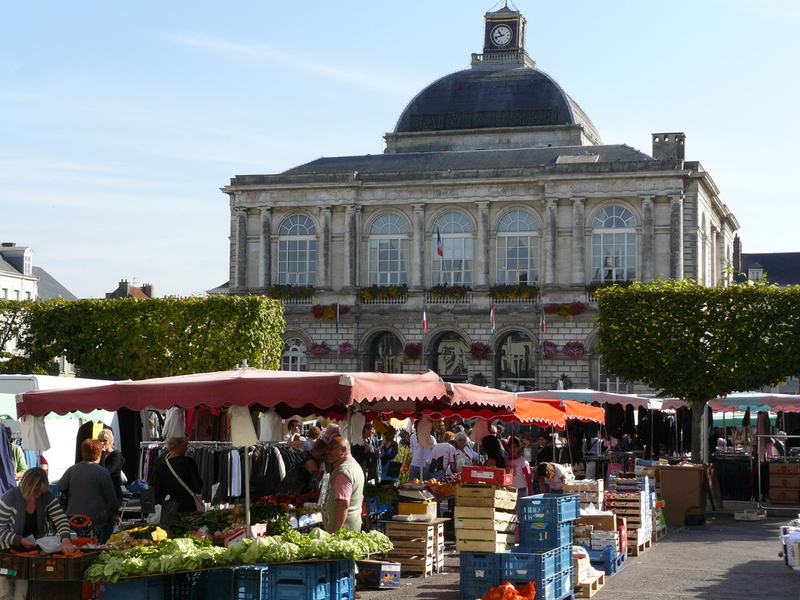 Saint-Omer is not completely homogeneous when it comes to small ethnic, linguistic and immigrant communities. 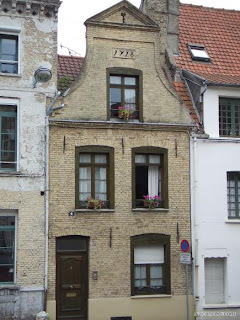 Haut-Pont is a heavily West Flemish section of Saint-Omer proud of its Flemish/Belgian roots. In the Southeast of the cathedral is a newly-formed Turkish neighborhood, but the majority of the local Turks are members of the Christian faith (i.e., Greek Orthodox or of ethnic Greek origin, Eastern Rite and Catholic converts) other than practising Islam, who arrived in France after World War I to escape religious persecution. Genealogists studied how thousands of locals have British, Dutch, German, Austrian, Hungarian, Czech, Slovak and Polish relatives, as a result of the region's mining and glass manufacturing industries (the now closed Luminix factory), have contributed to a revived post-war population. The old cathedral was constructed almost entirely in the 13th, 14th and centuries. A heavy square tower finished in 1499 surmounts the west portal. The church contains Biblical paintings, a colossal statue of Christ seated between the Virgin Mary and St John (13th century, originally belonging to the cathedral of Thérouanne and presented by the emperor Charles V), the cenotaph of Saint Audomare (Omer) (13th century) and numerous ex-votos. The richly decorated chapel in the transept contains a wooden figure of the Virgin (12th century), the object of pilgrimages. Of St Bertin church, part of the abbey (built between 1326 and 1520 on the site of previous churches) where Childeric III retired to end his days, there remain some arches and a lofty tower, which serve to adorn a public garden. Several other churches or convent chapels are of interest, among them St Sepulchre (14th century), which has a beautiful stone spire and stained-glass windows. 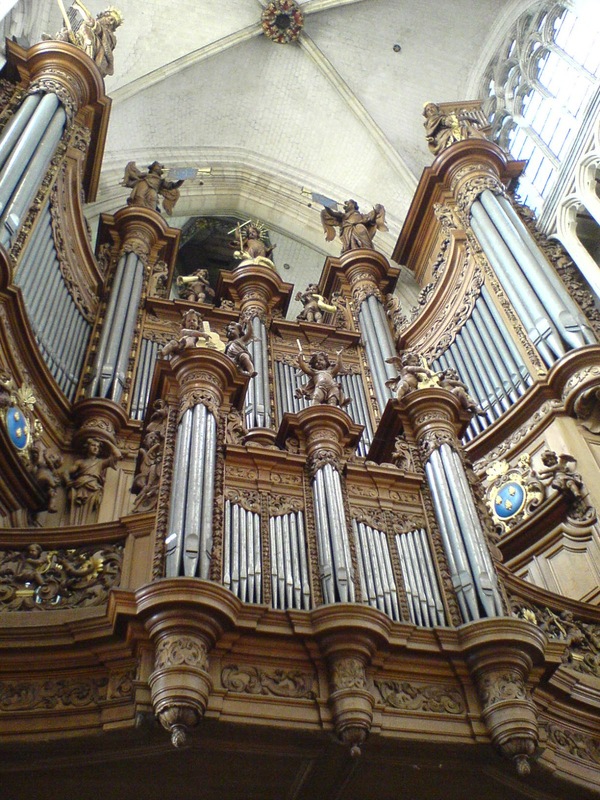 The cathedral has a huge baroque organ, which is still playable. A collection of records, a picture gallery, and a theatre are all situated in the town hall, built of the materials from the abbey of St Bertin. Several houses date from the 16th and 17th centuries. 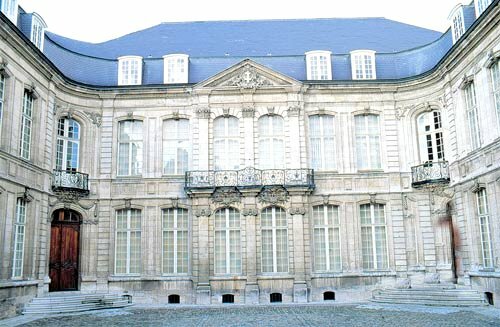 The Hôtel Colbert, once the royal lodging, is now occupied by an archaeological museum. The military hospital occupies the former English College, founded by the English Jesuits in 1593. It is now part of the Lycée Alexandre Ribot. The old episcopal palace adjoining the cathedral is used as a court-house. The chief statue in the town is that of Jacqueline Robin, who in 1711 helped the town resist a siege by Marlborough and Prince Eugene of Savoy. 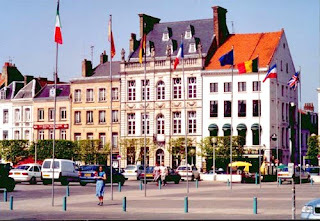 Saint-Omer is the seat of a court of assizes and tribunals, of a chamber of commerce, and of a board of trade arbitration. 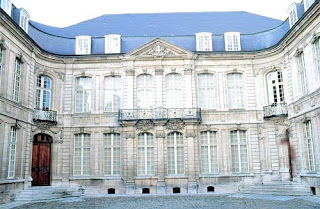 Besides the Lycée Alexandre Ribot, there are schools of music and of art. The public library of Saint-Omer holds, in its rare books section, one of the three French copies of the 42-line Gutenberg Bible, originally from the library of the abbey of St Bertin. The other two copies are in Paris. Godfrey of Saint-Omer, a Flemish knight and one of the founding members of the Knights Templar in 1119, is said to have come from the family of the Lords of Saint-Omer. King Henry VIII of England employed a swordsman from Saint-Omer for the execution of Queen Anne Boleyn, rather than having a Queen beheaded with the common axe. During the First World War on 8 October 1914, the British Royal Flying Corps (RFC) arrived in Saint-Omer and a headquarters was established at the aerodrome next to the local race course. For the following four years, Saint-Omer was a focal point for all RFC operations in the field. Although most squadrons only used Saint-Omer as a transit camp before moving on to other locations, the base grew in importance as it increased its logistic support to the RFC. Many Royal Air Force squadrons can trace their roots to formation at Saint-Omer during this period. Among which are No. IX Squadron RAF which was formed at Saint-Omer, 14 December 1914 and No. 16 Squadron RAF which was formed on 10 February 1915. Situated between the plains of Flanders and the hills of the Boulonnais, the Aa St Omer golf course benefits from an outstanding green setting in which the beauty of the surrounding countryside vies for attention with the impeccable course, surrounded by seemingly endless beechwoods and oakwoods. The undulating nature of the landscape renders this course quite challenging. The eighteenth hole, a long par five, requires a shot to get you over a small hillock to reach the green. In addition to the sporting aspect there is another typical of the countryside around the Aa, the readability of the greens. The site, despite being in the heart of the countryside, is close to the major hubs of activity in the region (close to an A1 off-ramp). 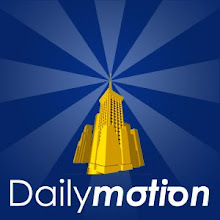 Another of its assets is that the site is classified as suitable for disabled golfing. To better preserve the environment, the course has been laid out following the natural undulating landscape of ancient farmland. The existing trees have been preserved enhanced and the course is only treated with organic fertiliser. The water consumption has been optimised on the basis of rainwater recovery. Each June, enjoy watching the St Omer Open, selected by the European Tour, and appreciate the magnificence of a course certified “Golfing Hub of Excellence”, by the French National Olympic and Sporting Committee. Click on the title of this article to visit St-Omer Aa Golf Club website in English. Discover the most beautiful surroundings of the North of France and Belgium in a typical 2cv with open rooftop. 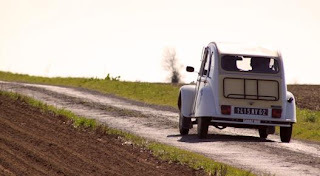 Imagine yourself driving a beautifully restored 2cv in a picturesque and romantic journey through the forgotten paths. “Les Belles Echappees” have created several beautiful itineraries, with local information about the area and cultural sightseeing. Perfectly restored 2CVs, fully convertible, 4 seats: “Les Belles Echappees” 2CVs are in perfect technical condition. Rental lease includes an insurance for passengers and the car. Basket, rug and cooler are available with everything else needed for a country picnic. 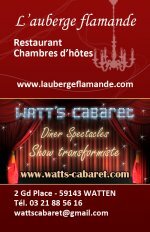 Because “Les Belles Echappees” have a passion for the North of France and love sharing their hints and addresses, they will give you what it needs to make your day truly unforgettable! 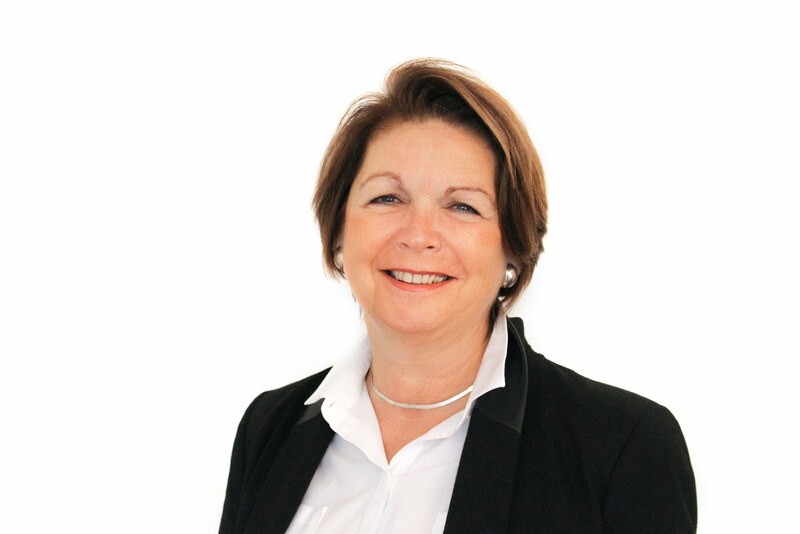 Click on the title of this article to visit Les Belles Echappées website in English. 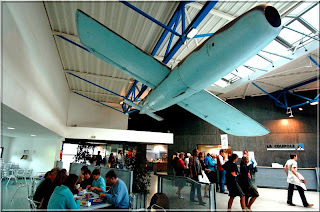 Situated in the Pas-de-Calais, 5 km from the town of Saint-Omer, La Couplole is a gigantic underground bunker designed by the Nazis in 1943-1944 to store, prepare and launch the V2 rockets (first missiles to reach the stratosphere), the secret weapon that Hitler was counting on to destroy London and reverse the course of the war. Rehabilitated as a History and Remembrance Centre, LA COUPOLE reveals, in an impressive setting, the challenges of total war and the stages in the conquest of space, which paradoxically resulted from the V2 technology. The Centre also expands on the theme of the German occupation from 1940 to 1945 in the Nord Pas-de-Calais, one of the hardest hit regions during the "dark years". Numerous audiovisual documentaries will enable you to explore these two major themes in the collective European memory, at your own rhythm, thanks to infrared audio-guided headsets. Click on the title of this article to visit La Coupole website in English. The Tourist Railroad of the Aa Valley is managed by the association CFTVA, which runs tourist trains on a 15 kilometers railroad between Arques and Lumbres, section of the former railroad line Saint-Omer-Hesdigneul. The line goes through the Aa valley, the regional Natural reserve des Capes and the marshes of Opal coast. A unique way to discovery unseen aspects of the region in an authentic "Picasso" train of the 1960's. 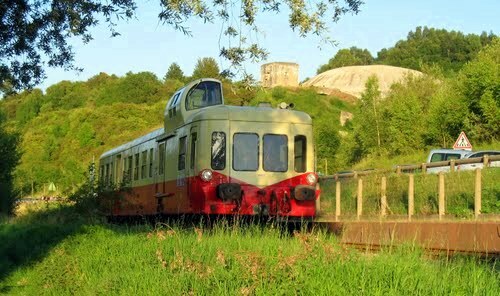 Click on the title of this article to visit Le Petit Train website. 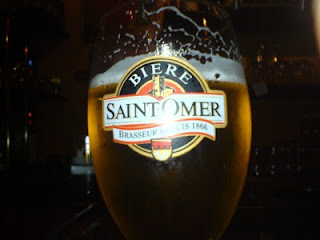 Saint-Omer is the site of a beer brewery. Founded in 1866, the brewery is still sited in the streets of old Saint Omer. It was purchased by Andre Pecqueur in 1985, who cut the range of products and invested in up-to-date production facilities. Now the brewery specialise in the light French lager-style beer that appeals to modern tastes. They produce 600 million 25cl green bottles a year. 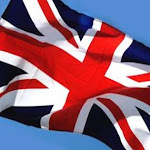 More than 40% of their output is exported, primarily to the United Kingdom. Gîte Chambre d'Hôtes Poidevin à Holque. 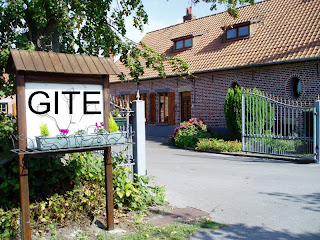 Ce gîte, situé près de Watten, entre Flandres et Audomarois, vous invite à découvrir le patrimoine de ces régions ou à faire une étape de randonnée. 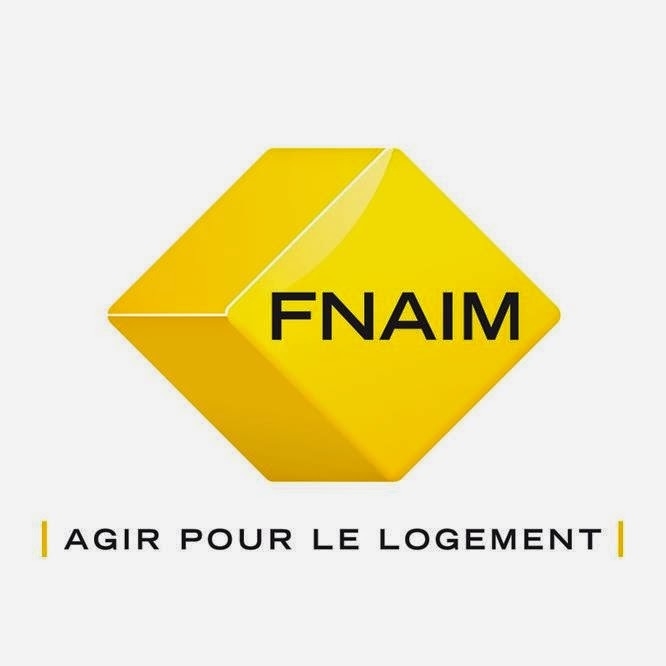 Il vous accueille pour des séjours allant de la nuitée à la semaine dans une ancienne fermette entièrement rénovée. L’appartement dispose d’une entrée indépendante, au rez-de-chaussée : cuisine aménagée avec four multifonction, à l’étage : 1 chambre avec 1 lit 140 et 1 clic-clac 140, salle de bain et WC. Terrasse avec salon de jardin. Parking. 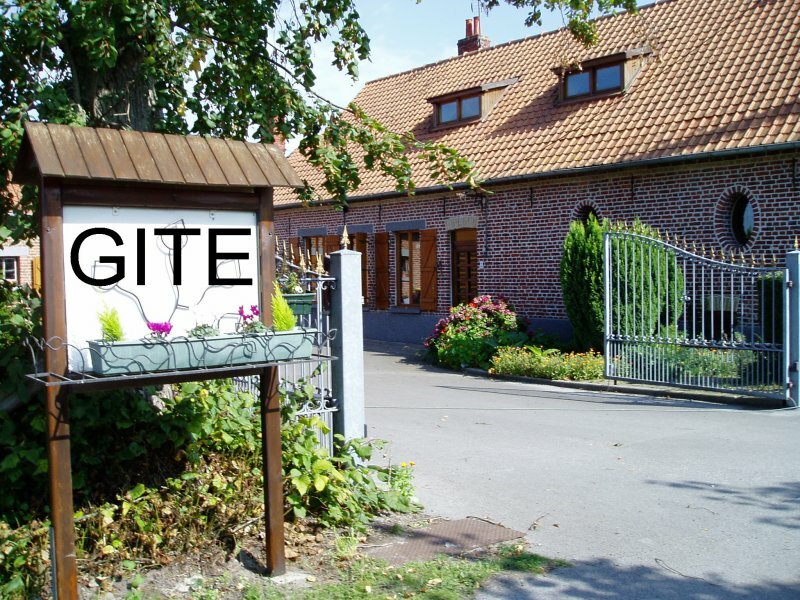 We are an established Gite and B&B located in the countryside between Flanders and Audomarois offering comfortable accommodation in our old renovated farmhouse. 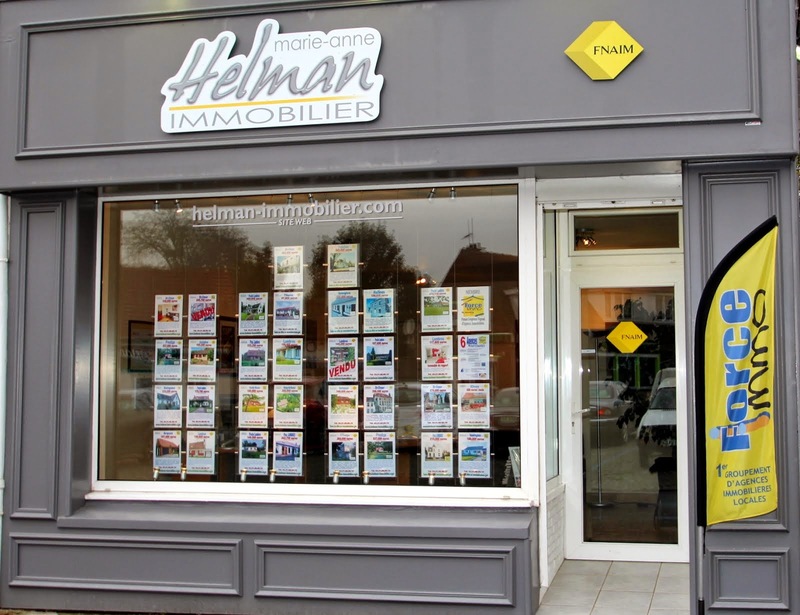 We are located in the peaceful village of Holque near St Omer, not far from Dunkirk and Belgium. Possibility to stay for a week or even one night. 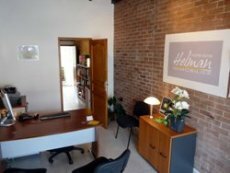 The apartment has a separate entrance, ground floor kitchen with combi microwave, with upstairs 1 bedroom (a single bed) and a sofa bed, bathroom and WC. Terrace and car-park. We have been granted the "Clé Vacances" distinction (approval 59M0184). € 32 for a night/ €180 a week. 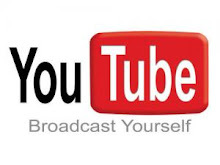 More information and services available on request. Wi Fi access free and unrestricted. Baby kit available. Sightseeings and shops nearby. 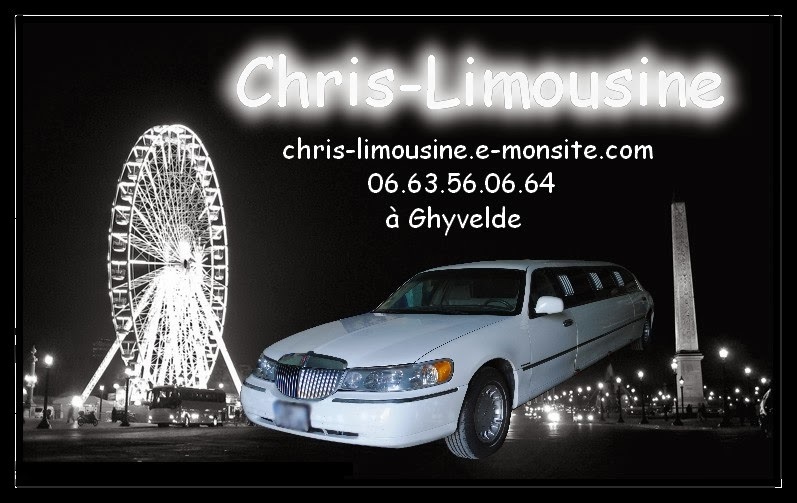 Booking: +33 (0)3 21 88 11 48.